Interview: Mike Pougounas New Zero God. Those who like to extend their music repertoire of the Gothic Rock scene far beyond our shores may already be familiar with New Zero God. 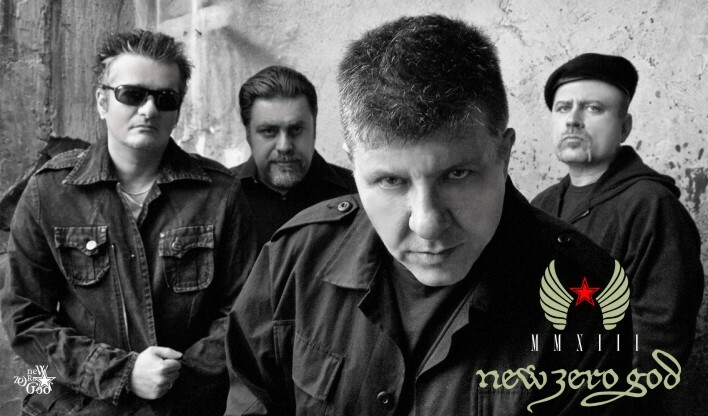 The band formed in 2006, and since then have been carving out a steady fan-base in both their native Greece and beyond, with a mix of Post Punk style taking inspiration from their Gothic Rock roots. With a back catalogue that spans almost 35 years in previous incarnations with his former bands ‘The Flowers of Romance’ and ‘Nexus’, Spittingflower Productions talks to New Zero God front man Mike Pougounas about the Gothic scene, his latest album, and working almost 35 years in the music industry. What can you tell us about the process of being back in the studio again following the release of New Zero God’s debut 2010 album ‘Fun is a Four letter word’? Mike – We had the good fortune of having an agreement with Secret Sin Records and we started recording the new album during June 2012. With “Fun Is A Four Letter Word” we didn’t hurry ourselves and it took us a whole year to record it, but with “MMXIII” things were different. Two songs from the new material had been tested during our gigs and we wrote the rest of the songs while working on them in the recording studio. The last year was a difficult year and we think 2013 will be even harder for everyone, that’s why the lyrics are gloomy and the album has a certain dark atmosphere. Mixing was done in early December and I believe “MMXIII” reflects the madness of the times we’re living through. Watch the teaser trailer for the forthcoming New Zero God album titled “MMXIII”. What are the triumphs & challenges involved in creating and developing a sound that you all agree reflects the direction of New Zero God? Mike – Bass player Harris Stavrakas and guitar player Lao are the new members in the band. Dimitris Steves and I remain from the old line up. I was playing with Harris and Lao when we were with The Flowers Of Romance so they are two musicians that I know their sound. The challenge was to make an album while avoiding the use of keyboards or fancy new sounds all while still keeping it fresh. We can’t say we invented any new music genre, we simply wanted to blend a strong 80’s feeling with good melodies and tweak the whole album to sound like 2013. It’s not the 80’s anymore as we all know. I think that we succeeded on making an album with songs that people will like as much as we do and this is what brings joy to a musician. Does the process of recording and working with fellow musicians from previous band incarnations help establish a greater sense of camaraderie within the current line-up of New Zero God? Mike – Yes, it does. We know each other for many years and it’s easier to communicate. Understanding plays a big role in bands, as indeed it plays in any human relationship. As music has to do with publically exposing your inner feelings, you at least need to be with fellow musicians that you trust will do their best to help you make your point. You’ve just released your first single from the “MMXIII” album “No Cure For Love” it’s a fairly upbeat track with a distinct nod to your gothic rock roots. Does this mark a return to your gothic rock origins and can we expect more of the same on the new album? Mike – Yes, it is a gothic rock album, there’s no doubt about that. I want to believe that “No Cure For Love” is just the beginning. We are anxious to see how people will receive it. We are sure that there is something there for everyone! It’s well documented that your music career represents an impressive back catalogue working with such musicians as Wayne Hussey of the Mission & playing the gig circuit with Sisters of Mercy, Christian Death, New Model Army and The Legendary Pink Dots. How relevant do you think these bands are today given the fact that many are reforming or still touring after 30 years or more? Mike – Touring means that they had good songs and people want to see them on stage. It also means that they still have something to say. They still touch people’s hearts. It’s a nice experience for the younger generations to see them on stage. On the other hand, musicians need the audience as much as the audience needs them. Music is an expression and the feeling that there are people out there loving what you do is priceless… It’s the essence of life! The current line-up of New Zero God almost mirrors that of your previous band ‘The Flowers of Romance’ in the late 1980’s Is there any pressure or expectation from the fans to reform ‘The Flowers of Romance’ or revisit your previous back catalogue? Mike – They offered us money for a reunion in the past but I turned it down. I am honoured by the fans for loving the old band but there is no chance to use that name again. It belongs to the past. New Zero God is ¾ of The Flowers of Romance. We might be playing a couple of the old tunes in our gigs but that’s all. It is always difficult to start again under a new name as we did but we are doing great and we have new things to say ’cause life moves on. You founded Cyberdelia Records in 2000 – how do you think the music industry differs to-day from how things were back then? Mike – I think the industry changed when the CD format hit the market. The internet was the next big blow. Suddenly printed mags were out of the picture since people could find information on the net. Record stores had to close or become electronic shops and record labels collapsed as piracy took over. Today you can buy music directly from the artist or pay 1 euro to download one of his songs from an electronic store. The difference is huge from the days that I had the crazy idea of founding Cyberdelia Records and because of these reasons, it didn’t last. I find it funny that there are 30 year old people out there that don’t have a turntable in their house but their “father has one”… I come from a generation that vinyl was god. Everything changed so rapidly. Do you think that new bands trying to break through now benefit from greater exposure via the internet? Mike – Yes, they do. The internet is a wonderful way to reach a vast audience in no time, by promoting, communicating, giving free stuff to friends of the band, and making your music available everywhere in one hour. On the other hand, it saves us all a lot of time. You listen to a song on the net, if you like it, you go for another one by the same artist or you buy it. If you don’t like it you just move on to the next artist. Fifteen years ago people were not even sure if a letter they sent ever reached the receiver. We sent promo material to magazines back then and sometimes never heard from them again. I know this doesn’t sound right but sometimes no, it wasn’t that the material was bad…it was that they just never got the package. But how would you know? Since it was taking a week for the package to reach them, a few days at least for them to listen to the promo, and then one more week for their response to reach you if they liked it! Today thanks to the internet things are different. Of course there are pros and cons in every aspect of life. Finally, following the release of your second album “MMXIII” what does 2013 hold in store for New Zero God? Mike – New Zero God will be on the road in 2013. We start late February with a gig in Athens, a few other Greek cities will follow, and we are now discussing some gigs in Germany and Switzerland. I hope we make it to the UK this year! New Zero God album titled “MMXIII” is due for release through Secret Sin Records January 2013.